Knightsbridge is the home to many upmarket shops including the renowned department stores Harrods and Harvey Nichols. International fashion houses, for example shoe designers Jimmy Choo and Manolo Blahnik, a Gucci, Chanel and two Pradastores are nearby. There are also hair and beauty salons and antique shops. Also in the area are renowned restaurants and comfortable pubs can be found tucked away in secluded mews. Harrods, with its red terracotta tiled exterior and olive green awnings and liveried doormen is the focal point for shopping in Knightsbridge. It is the largest store in Europe with over 230 departments run by more than 5,000 staff. 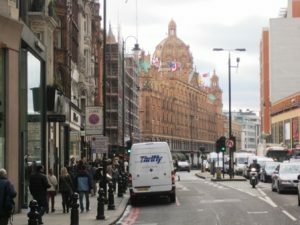 Harrods is renowned for quality of its merchandise which is often priced accordingly, however it is also possible to find excellent goods at reasonable prices especially at the sales. The food halls on the ground floor are famous for both their enormous range of quality fresh food and the highly ornate environment. Above the fish, meat and poultry halls are tiled ceilings depicting The Hunt made by W J Neatley in 1902, and art deco ceramics are to be found all over the store. Knightsbridge is a district in west London to the south west of Hyde Park and was originally a small hamlet named after a legend of two knights fighting to the death on a nearby bridge over the River Westbourne. The river now runs underground and has been dammed to create the Serpentine Lake in Hyde Park. For many years Knightsbridge was renowned both for its taverns and as a haunt for highwaymen and robbers but it was transformed in the 19th century and is now noted for its expensive residential area and upmarket shops, the most famous of which is Harrods. Harrods started life as a small grocery store founded by wholesale tea merchant Charles Henry Harrod in 1849. In the 1860s his son Charles took it over and built it into a massive department store. By 1890 it had grown to such a degree that it installed London’s first escalator to take customers to the upper floors (where an assistant stood ready with smelling salts and brandy for those with a nervous disposition). The name Harrods, with its motto ‘Everything for Everyone Everywhere’ became synonymous with quality and it attracted – and still attracts – customers from all over the world. It is now housed in a five storey building dating from 1900 which occupies a whole block on Brompton Road and which is brightly illuminated at night. The store was bought by the House of Fraser in 1959 and then by the Egyptian-born al Fayed brothers in 1985 for £615 million. It has recently passed on to Qatar Holdings for a staggering £1.5 billion.